DMZ is the buffer zone between North and South Korea, the border where negotiations take place. It is also one of our "let's see!" in our Korea itinerary. First, I realized that we needed to book the tour in advance - legally speaking we can't go on our own thus the need for a tour group. Second, I fear that it might not be as safe as what the Internet is telling us. And third, worth it ba sa presyo? Anyway, I went for it nonetheless because as always I asked myself my biggest travel question: if not now when? We booked through our inn keeper, who called Sun Burst Korea agency around 24 hours before our planned date. Before we knew it, we were set for pick-up by our tour guide directly at our guesthouse at around 7:30 in the morning the next day. Agad agad. Our guide looks very madam, complete with LV bag, Chanel stud earrings, thick black shades, and heeled boots. Haha! She's super nice though, and I really enjoyed her company. I think Paul and I are her favorites, hehe (Tracy opted to stay in the hostel). Anyway, payment was made immediately, the moment we met our tour guide at our guesthouse. There are different DMZ Tours, mind you. I have no idea about this before. There's the DMZ half day tour (8am - 2:30pm | 38 USD / 38,000 Won) which will cover pick-up from hotel, ride expenses, the Imjingak Park, Unification Bridge, DMZ Pavilion, The 3rd Infiltration Tunnel, Dorasan Observatory, Dorasan Station, and a tourist stop-over (either ginseng or amethyst center), before heading back to Myeongdong. Second is the NLL whole day tour (8am - 5pm | 68 USD / 80,000 Won) which will cover hotel pick-up, the Iron Fence Zone, Aegibong Peak Observatory, Lunch, DaeMyeong Harbor, Gimpo Marine Park (Warship), and a tourist stop-over (either ginseng or amethyst center), before heading back to your hotel. There's a whole day tour, which you can check out in different travel agency websites like this: DMZ and JSA 1 Day Tour. They also have a half day DMZ Tour. We picked the first one because of time constraints. It was a buzzer beater decision, and was also same day as Paul's flight back home to Manila, huhu! Anyway, so we rode our tour guide's van along with another group of three Spanish friends. It was a long and sleepy ride to the bus terminal - but I enjoyed the foggy view. Streets were lined with cherry blossom trees, a nice sight in the morning. I tried hard not to take a nap, as our tour guide told us interesting stories and trivia on the infamous relationship between North and South Korea. We then transferred to a bigger bus along with other tourists (mostly old Korean families). Our tour guide was super good at her work - accommodating everyone's requests, photo ops, and reminding us diligently with the rules ("Or else I will lose my job!"). There are a lot of them, mostly on taking pictures! I avoided taking bus and window photos, takot ako and kawawa naman si madam! We had several stop-overs, mostly for passport and bus inspections (no pictures). When the soldier went out of our bus, our tour guide told us that their soldiers are all good looking (haha! ), very manly, and they are very proud of them. Kinikilig si Tita while saying this! Haha! I think Korean men are required to serve for number of years in the military, so I was half expecting to see a Korean star on-duty hihi (asa, haha!). Located in Paju, South Korea, this park was built to console those from North and South Korea who were unable to return to their hometowns because of the division. You will also see statues and monuments on the Korean War, and an observatory where you can glimpse the very secretive North Korea. The Liberty Bridge is a former railroad bridge used by repatriated POWs / soldiers returning from north - the only egress point and the only direct link to Camp Greaves, Liberty Bell, and Panmunjom. A foot bridge where nearly 13,000 prisoners of war were traded off at the end of the Korean War. (3) Koreans born in the North, since it is in their culture to return to their birthplace to honor their ancestors during certain Korean holidays - this is the nearest that they can go back. An interesting story from our guide was that the South Koreans tried to send a message of peace to the other side by flying white balloons from this corner. The balloons only received gunshots. It felt hopeless, but from the stories they tell us - South Korea is not a give-uper. They continue with their pursuit for peace and unification, however impossible it looks ATM. We were rushing back to our meet-up point so we can go to our next destination. I just saw a glimpse of the train car and this railway that shows the destruction that the war caused. Our next stop was at the Third Infiltration Tunnel - my favorite in this tour. 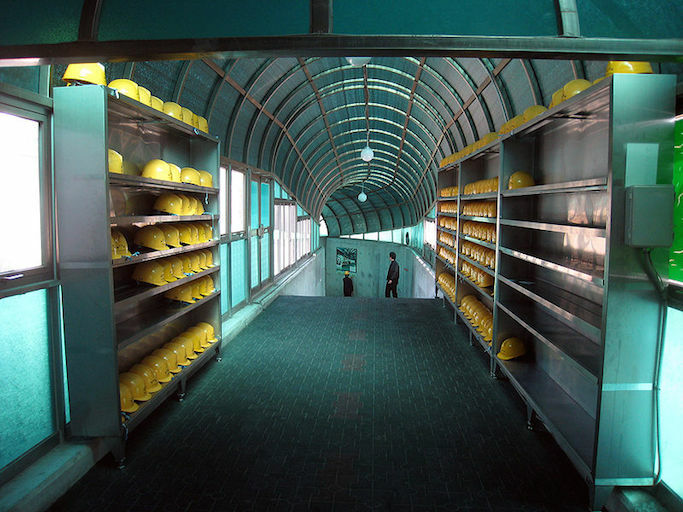 We left everything in the lockers, were given helmets before proceeding to the deep, 1,635 meter tunnel. I fought with my claustrophobia the whole time. The tunnel was discovered only on October of 1978. It was already around 1 mile long, and only 44km from Seoul! 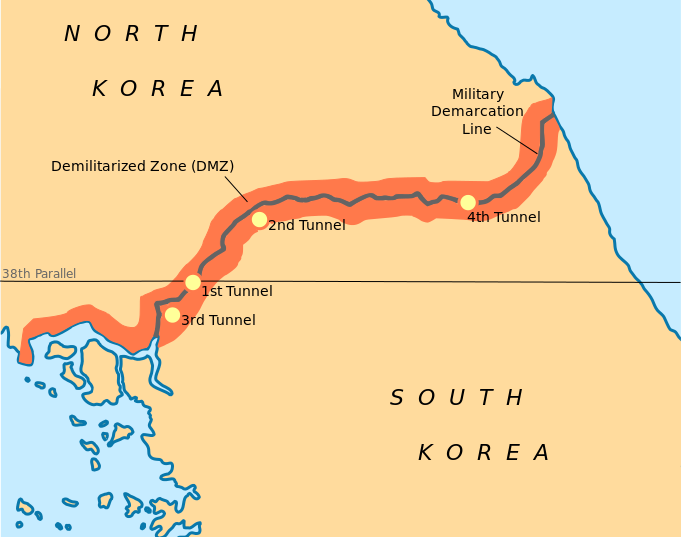 It is one of the four known tunnels under the border between North and South Korea, said to be built for a surprise attack on Seoul from North Korea. Scary! They believed that there are up to TWENTY more tunnels out there. Eventually, North Korea denied building the tunnel, declaring that it is just a part of a coal mine. But upon observations, the tunnel shows NO signs of geological likelihood of coal in the area. They don't need these hidden passageways now, though, with more advanced weapons and technology. We passed through this, which is harder than it looks because it gets narrow and lower as we went farther. I heard heavy panting everywhere, and saw some old folks pausing in between. It was a tiring trek down, and then an uphill climb back. This is an interesting railway station situated on the Gyeongui Line. The Dorasan Station once connected North and South Korea - and has now been restored but still not operational till the unification. "Not the last station from the South, but the first station toward the North." The plan was to make this the first international station to get you to different parts of the world, making import / export business easier and more economical. Due to the ongoing war, Dorasan Station looks like a museum with useless waiting area and ticket booths. There's a small souvenir shop at the corner of the station, where I bought a military DMZ cap and these DMZ Chocolates created with high grade soy bean from North Korea (?). You can also purchase roundtrip tickets here to North Korea, but just as souvenir. The government promised that once the war ends, they will give free visits to the North. Wow! Oh, another interesting story that stuck to me are the people who reside at the DMZ. I saw some of them heading back to their homes - in a street with standard looking houses. Nothing stood out. It looks peaceful yet lonely, but who am I to judge? The two peace villages (one near North, one near South) were created by the UN for Koreans who were already living in the area (requirement). They are mostly farmers, tending on rice and soybeans. They do not have to pay taxes, and there are only a few of them now (200 families). If I remember it correctly, they can only stay in that zone forever, and can't travel to the North or South or anywhere in the world. Where you can take a glimpse of North Korea, no photos allowed. After that, we headed back to Seoul and had a short stop-over at a Ginseng Center. Most of the items there are very expensive since ginseng is Korea's specialty, so we headed to the grocery and bought affordable pasalubongs. By request, the group was dropped off at the Nandaemun Market, another tourist spot in Korea, so we were grateful to our tour guide. Final selfie with madam! Thank you for the wonderful experience and learnings! I remember getting my highest grade in school from my history classes, because I treat them as stories. The story-lover in me was super satisfied that day! We picked up Tracy at our guesthouse, before having late lunch in a nearby restaurant: Pomato. I think this was where I had the best bibimbap and unli kimchi for this entire trip! After our cheap but authentic meal, we walked Paul and his luggages to the MTR for the airport. Huhuhu, #sepanx.